Calpulli, a word of the Nahuatl language, refers to the groups or clans categorized by trade which contributed to the whole of the Aztec civilization. 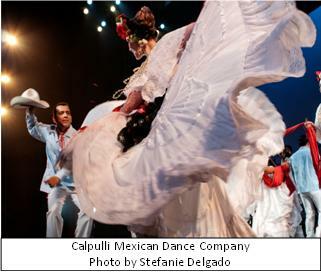 Calpulli Mexican Dance Company is a calpulli of artists dedicated to the traditions of Mexico and Mexican American cultural expression through dance and music. Its mission is to teach and produce dance-based programming, incorporating live music and theatre, to promote the richness of Mexico’s cultural heritage. 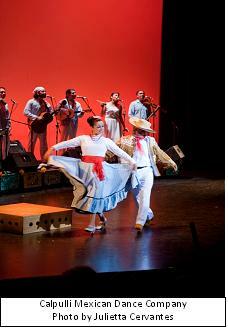 Calpulli Mexican Dance Company is ever-exploring, dedicated, and passionate. Ever-exploring describes our artistic body of work and educational programming which have grown by leaps and bounds in the last ten years. Along with traditional and folkloric celebrations that are the main component of Calpulli's repertoire, the Company continues to explore original musical compositions, contemporary and fusion dance works, and community engagement opportunities. The Company has also honed its ability to enrich educational experiences in schools throughout the tri-state area of New York, New Jersey, and Connecticut. Dedicated describes the performers, staff, teaching artists, students, and volunteers who make every Calpulli event memorable and a great success. We compensate all of our staff and performers and realize they often go beyond the hours they are paid to research, create, and plan the wonderful projects that Calpulli delivers consistently at a high caliber. Passionate is the mindset of these individuals who dedicate themselves to dance, community, and education. What was the impetus for Calpulli’s creation? Calpulli was founded with the goal of reaching new heights within our art form. This means high-quality artistic programming; professional opportunities for dancers, musicians, and arts managers; challenging the boundaries of how "tradition" is depicted in modern times; collaborating with diverse artists and incorporating an array of media in our works; and serving the community through enriching educational and cultural programming. Co-founders Juan Castano and Alberto Lopez continue to support and enhance this vision along with Artistic Director, Noemy Hernandez; Musical Director, George Saenz; performers; students; and staff. Calpulli is proud of the strides it has made in its first decade as a company and organization. The company is celebrating its tenth anniversary. With this in mind, what is the company’s vision for the next ten years? The vision for the next ten years is the next level of achievement. 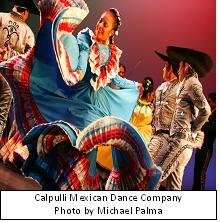 In those ten years, Calpulli will continue to produce traditional and contemporary dance works with live music; expand its national and international touring; grow its Board of Directors; formulize a curriculum for its educational programming; and acquire a new home for community outreach while continuing to partner with organizations and individuals.